For a while there, I was on a soft food diet. No, not by choice. A little over a week ago, I had my thyroid taken out after finding out I had Thyroid Cancer. It sounds a lot scarier than it was, I promise. It was a pretty easy procedure. At least it was for me- I was asleep the whole time. And I had a great time coming out of anesthesia, chatting to the nurses, probably revealing more about myself than they ever wanted to know. After the surgery, I was left with a two-inch long scar and a very sore throat. So that meant lots and lots and lots of soup and ice cream. I tried to spice things up with smoothies and mashed potatoes, but still. Things got a little monotonous. Though I wasn't particularly hungry (laying on the couch for 18 hours does take a lot out of a girl), my taste buds started to protest. I thought of a solution to my food rut dilemma, as I was sprawled across my bed, entering the fifth hour of my Skins marathon. 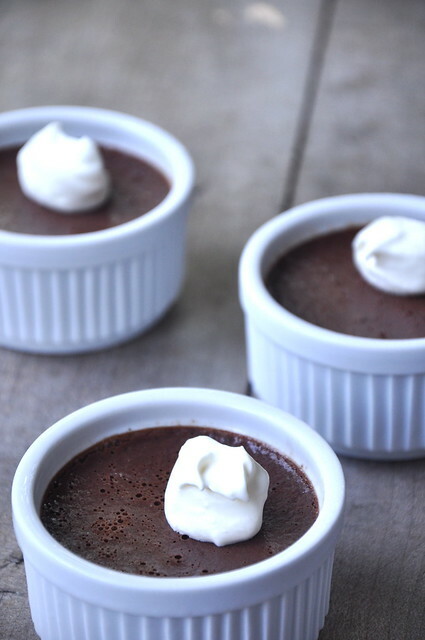 Pots de creme. They're creamy and delicious. Fitting the bill for every need I had at that moment. Unfortunately, Riley gobbled them up before I could even dig my spoon into one. I don't blame him. I mean, who could? They are pretty damn good, after all. So, I've made them again, despite having moved onto sandwiches and kettlecorn. 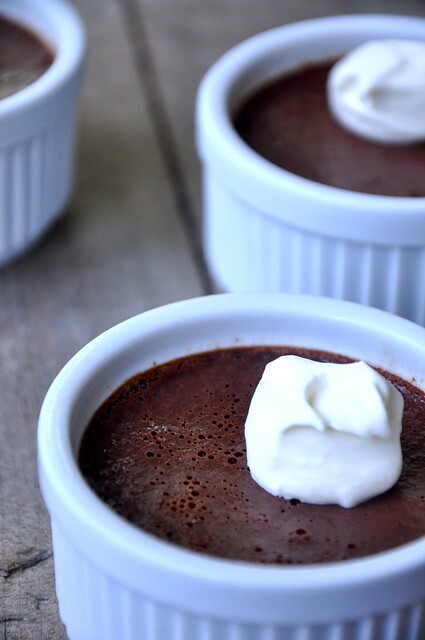 But I just might pretend I'm on a soft food diet again, so that I have the perfect excuse to eat pots de creme all day long. Preheat oven to 300. Heat heavy cream and whole milk over low heat until just simmering. Stir in chocolate and sugar until melted. 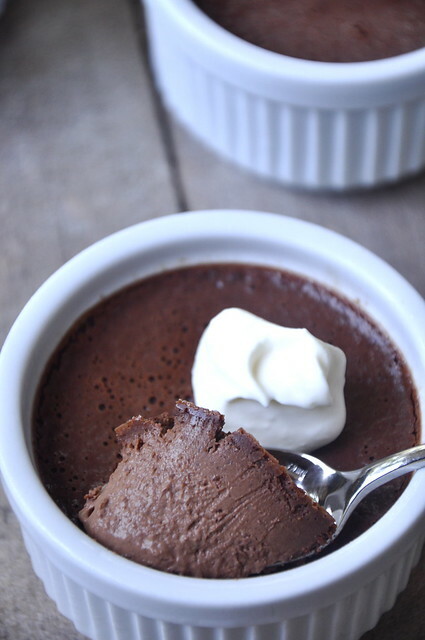 In a medium bowl, whisk together egg yolks, cocoa powder, liqueur, vanilla extract, and salt. Pour milk mixture through a strainer into egg yolk mixture and whisk to combine. Divide between four ramekins. Place ramekins in a roasting dish. Fill dish with water halfway up sides of ramekins. Put roasting dish in oven and bake for 30 minutes. Let cool completely before transferring to fridge. Serve cold with whipped cream. 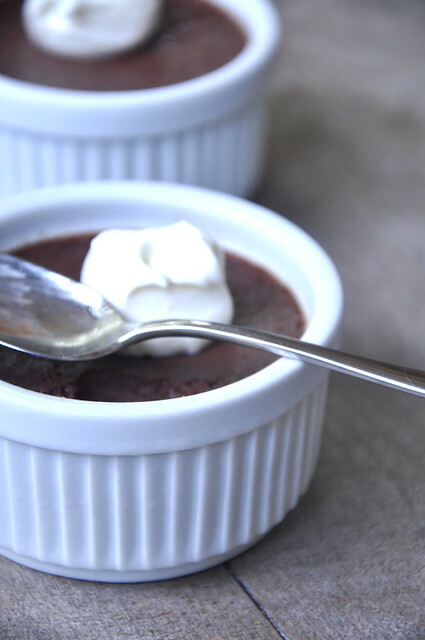 thanks, I've been looking for a pot de creme recipe for a while, and this looks like the winner!